Today’s blog is the second by a Botanist in the Kitchen, this time Katherine. It is a revisit of the sweet chestnut, last featured in 2015 when we heard about the devastating chestnut blight. In today’s blog we hear tell of the rather grown up flavour of the chestnut and a need for lowered expectations. The sweet chestnut of Europe is a true chestnut (Castanea sativa), not the beautiful but toxic horse chestnut (Aesculus hippocastanum), which so famously covers Paris with its pink-eyed blossoms in April. They are not very close relatives, as the last common ancestor of sweet Castanea (Fagaceae) and showy Aesculus (Sapindaceae) is estimated to have lived about 100 million years ago. I have happily returned to Paris many times in the summer and fallen in love with its horse chestnut trees. 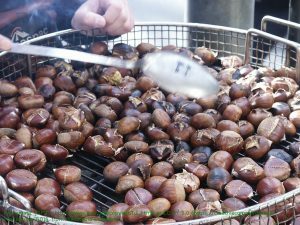 In that frozen moment in December, however, the spell of Christmastime in the City of Lights was broken for me when I realized that I could live happily without any more true Castanea chestnuts. Read more on the pros and cons of sweet chestnuts here. This entry was posted in Advent, Herbarium RNG, Public Engagement with Science and tagged #AdventBotany, #AdventBotany2018, chestnut, sweet chestnut. Bookmark the permalink.